While Black Friday will be the biggest day in the history of ecommerce, purchasing for the holidays is occurring earlier and earlier each year, which is influenced by major retailers like Walmart and Target triggering Black Friday deals in advance of the official day. Criteo data was featured in this report on Black Friday on CNBC. The data comes from Criteo’s Sponsored Products retail network, which in the US includes: Walmart, Target, Best Buy, Toys R Us, Wayfair, Kohl’s and Macy’s. The numbers Criteo is seeing are in line with spending projections from sources like eMarketer, which has estimated that holiday ecommerce spending will increase 16.7% this year over last. With shoppers home with family and friends, and some major retailers deciding to treat their employees to a day off, Thanksgiving has become an enormous day for ecommerce. There is a post Turkey pop: The biggest hour of the day for purchasing was 9 PM EST. Shoppers had finished eating and gotten back to gifting. 46% of all purchases were made on mobile phones: with shoppers at home – and likely not in front of their computers — they turned to the nearest available shopping device, the phone. This is strongest day for mobile commerce Criteo has yet seen in the US. Criteo assesses retail site search term data throughout the year to determine breakout products. A flatulent robotic monkey called a Fingerling first appeared on the top 1000 terms list in August at #385. By November, the term had become the top searched toy, branded term and overall term, searched for more than Christmas trees and televisions. The products spawned an entire marketplace centered around Amazon in fake monkeys. Media outlets like Forbes began to cover where to get real ones: hint, the real ones are from WowWee Toys. 12 Days of Socks: a smartly packaged way to deliver a gift everyone can use that comes in men’s women’s, kids, Disney princesses and even Star Wars and Harry Potter editions. Our Generation vs Barbie: Our Generation, a more affordable American Girl type doll with a backstory, has been a top searched toy throughout Q3 and has risen 5 places in the last month. But Barbie is rocketing up the list rising 29 places in one month. That also ran boyfriend, Ken, has been buffed up and is now called Ken Fashionista. Some models even sport man buns. Barbie is as glam as ever, but you can get her in varying body types and with your choice of careers that are not in the fashion industry. Happy Black Friday and stay tuned for Criteo’s updates throughout the weekend. The NRF projects that 164.6 million shoppers will make a purchase either in a store or online. We can’t wait. 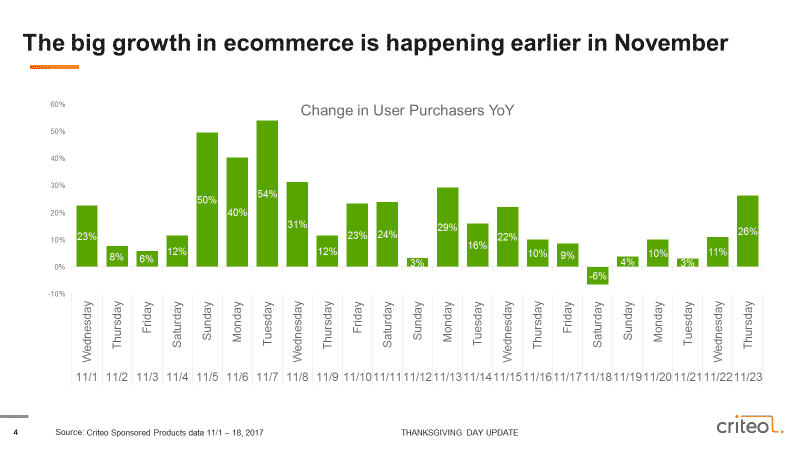 Read Criteo’s Thanksgiving Ecommerce Update below!